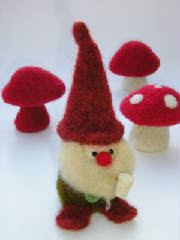 Anina knit and felted this cute Gnome and Mushroom set. It’s a Marie Mayhew design – we have the patterns as well as a kit with extras like roving for the nose and beard, beads for the eyes, cork for the pipe and plastic pellets and fibrefill for stuffing. If you prefer, make a few simple changes and turn your gnome into Santa Claus. Have a look at photos of Anina’s gnome on her ravelry site. 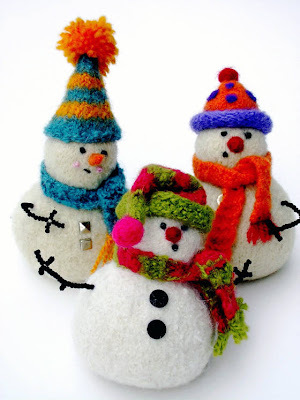 The pattern includes directions for three hat designs and a scarf. These babes will be about 4 1/2″ tall after felting. 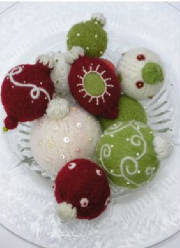 The pattern includes three ornament designs: a classic ball, teardrop and beaded ball. 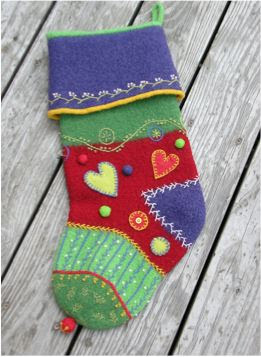 Use your imagination for embroidery and embellishments to make your own unique stocking. The finished size is about 8″ wide and 22″ high. This entry was posted on Saturday, November 22nd, 2008 at 1:39 pm	and is filed under Uncategorized. You can follow any responses to this entry through the RSS 2.0 feed. Both comments and pings are currently closed.